Only a couple of years after settling into his new home in northern England, James Herriot is called to war. In this series of poignant and humorous episodes, the great veterinarian shares his experiences training with the Royal Air Force, pining for a pregnant wife, and checking in on the people back home who made his practice so fascinating. As the young men of Yorkshire are sent into battle and farmers consider the broader world theyre a part of, Herriot reflects on the liveshuman and animal alikethat make his home worth fighting for. James Herriot (19161995) was the pen name of James Alfred "Alf" Wight, an English veterinarian whose tales of veterinary practice and country life have delighted generations. 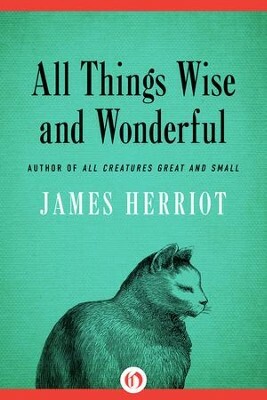 Many of Herriots worksincluding All Creatures Great and Small, All Things Bright and Beautiful, All Things Wise and Wonderful, The Lord God Made Them All, and Every Living Thingbecame international bestsellers and have been adapted for film and television. Though largely fictional, Herriots stories rely on numerous autobiographical elements taken from his life in northern Englands Yorkshire County, and they depict a simple, rustic world deeply in touch with the cycles of nature. I'm the author/artist and I want to review All Things Wise and Wonderful - eBook.